Turco in 2012 during his brief tenure with the Boston Bruins. Marty Vincent Turco (born August 13, 1975) is a Canadian former professional ice hockey goaltender who played 11 seasons in the National Hockey League (NHL). He played nine seasons with the Dallas Stars and one season each with the Chicago Blackhawks and Boston Bruins. Due to his puck-handling prowess, Canadian hockey personality Don Cherry named Turco "the smartest goalie in the NHL". Turco is also an in-studio analyst at NHL Network. Unlike most Canadians who have played in the NHL, Turco did not play major junior hockey in the Canadian Hockey League (CHL), instead playing for the University of Michigan, under Red Berenson, with whom he won two NCAA championships. After playing minor hockey for the S.S. Marie Legion program in his hometown, Turco was undrafted by the Ontario Hockey League (OHL). He signed as a 17-year-old with the Cambridge Winterhawks Jr. B. team in 1992 and played two seasons with the Ontario Hockey Association (OHA) team before accepting an NCAA scholarship at the University of Michigan, a member of the Central Collegiate Hockey Association (CCHA). Turco was drafted in the fifth round of the 1994 NHL Entry Draft by the Dallas Stars, and went on to play for Michigan that fall. Turco earned many awards in his four years at Michigan, including Rookie of the Year in 1995, Tournament MVP in 1998 and nominations to the First All-Star team in 1997, the Second All-Star Team in 1998 and the All-Tournament Team in 1996 and 1998. After graduating, Turco went to play for Dallas' International Hockey League (IHL) affiliate, the Michigan K-Wings. In 1999, he was named IHL Rookie of the Year. After two years playing for the K-Wings, Turco was given the opportunity to be a backup for Ed Belfour in Dallas. He spent the next two years with the Stars gaining experience as the team's backup. After the 2001–02 season, Dallas decided to make Turco the starting goaltender, allowing Belfour to sign with the Toronto Maple Leafs. Turco as a member of the Dallas Stars. In his first year as the starting goaltender, 2002–03, Turco's goals against average (GAA) of 1.72 set a modern NHL record. (Miikka Kiprusoff broke Turco's record the next season with a 1.69 GAA.) Turco played in the NHL All-Star Game during the season and was named to the Second All-Star Team following the season, finishing second in Vezina Trophy voting as well, behind Martin Brodeur, for the NHL's top goaltender during the regular season. His .932 save percentage was also best in the NHL that year. However, he was unable to lead the Stars past the Mighty Ducks of Anaheim in the Western Conference Semifinals of the 2003 Stanley Cup playoffs. During the 2003–04 season, Turco continued to give the Stars quality goaltending, again playing (and starting) in the All-Star Game. However, when the Stars played the Colorado Avalanche in the first round of the 2004 playoffs, Turco struggled, receiving blame from some for the Stars losing the series in five games. In the 2005–06 season, Turco won a career-best 41 games, eight of them in shootouts. Turco's experience in the 2006 playoffs was similar to the prior season, again losing in five games to the Avalanche. On April 13, 2007, in the Stars' first and only playoff series of the 2006–07 season, Turco recorded his first ever playoff shutout against the Vancouver Canucks to tie the series 1–1. After the game, he said, "We know we can beat these guys here [Vancouver], or at home, or anywhere." Turco went on to lose against the Canucks at home in Game 3, dropping a 2–1 overtime victory, when Taylor Pyatt got a quick one-time shot off a feed from Bryan Smolinski. In Game 4, once again the Stars could not put up a win, losing to the Canucks 2–1 off of goals from Mattias Öhlund, then the game winner from Trevor Linden. The Stars then went on to win Game 5 in the series with 1–0 overtime win. Brenden Morrow scored the game's only goal 6:22 into the first overtime period, allowing Turco to earn his second career playoff shutout. Turco followed this up with his third shutout of the series in a 2–0 win. The series ended on April 23, 2007, with a score of 4–1 in favor of Vancouver, with Trevor Linden again scoring the eventual game-winner in the second period. The three shutouts posted by Turco in that series represent a record amount of shutouts in a single playoff series, a mark that has been tied by the New Jersey Devils' Martin Brodeur, Anaheim's Jean-Sébastien Giguère and the Philadelphia Flyers' Michael Leighton. 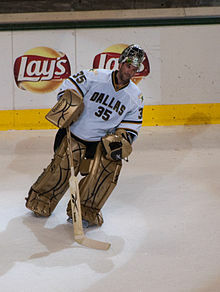 Turco recorded 32 wins in the 2007–08 season and helped the Stars to playoff wins over the defending Stanley Cup champions Anaheim and the San Jose Sharks, before losing in six games to the Detroit Red Wings in the Western Conference Finals. 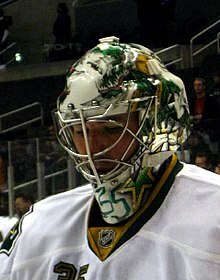 On January 15, 2009, Turco recorded his 421st game for the Stars, becoming the franchise's all-time leader in games played by a goaltender, surpassing Cesare Maniago's near 33-year old record of 420. He would also pass Maniago later that month in total minutes played, on January 29, while also winning his first regular season game at Joe Louis Arena in 11 tries against the Detroit Red Wings. On February 9, he again broke yet another of Maniago's records by starting in his 24th consecutive game in goal. However, the Stars failed to qualify for the playoffs. On April 13, 2010, it was reported Turco would not be re-signed by Dallas, ending his nine years with the Stars. On August 2, 2010, Turco signed a one-year contract as a free agent with the reigning Stanley Cup champions Chicago Blackhawks, replacing Antti Niemi as their starting goaltender. The Blackhawks had previously swept San Jose in the Western Conference Finals in the playoffs. His first win with Chicago came on October 15, a 5–2 victory over the Columbus Blue Jackets. Later in the season, he was benched by the team and was replaced by Corey Crawford as the starting goaltender. He ultimately saw action in 29 games, compiling an 11–11–3 record. Turco with the Boston Bruins in 2012. In December 2011, Turco signed a deal with the EC Red Bull Salzburg of the Erste Bank Hockey League in Austria. It was only a short-term contract and Turco was only expected to play December 16 and 18 in the European Trophy Finals/Red Bull Salute. However, the following month, in January, he signed a deal with EC Salzburg through the end of the EBHL season, including an NHL-out clause that lasted until the NHL trade deadline, which occurred on February 27. On March 5, 2012, Turco was signed by the Boston Bruins. Turco cleared waivers on March 7 and joined the Bruins. He was signed after it was learned that the Bruins' back-up goaltender, Tuukka Rask, would be out four-to-six weeks with a lower abdominal strain. Since he was signed after the NHL trade deadline, Turco was not eligible to participate in the 2012 playoffs. Before signing with EC Salzburg, Turco worked as an analyst for the NHL Network, providing in-studio analysis during the show On the Fly. Turco joined NHL Network's team after the Blackhawks were eliminated by the Vancouver Canucks during the 2011 playoffs. Turco says a full-time job in television might be in his future, but he would like to play again and is not ready to retire. Turco joined Team Canada for the 2011 Spengler Cup after not playing regularly for nine months. Turco also appeared in two commercials for the NHL. In a 2006 commercial for the NHL's "Game On!" promotion, Turco can be seen in back of a family's car to remind the father that the NHL season is starting. Turco can also be seen in the NHL's "Road Trip" commercial, which was debuted during the 2007 NHL All-Star Game in Dallas. Turco can be seen sleeping as fellow goaltenders Roberto Luongo and Ryan Miller set him up to cover himself in shaving cream as a result of a prank. All-time NCAA wins record with 127. Turco and his wife Kelly have two daughters, Hailey (born early 2002) and Katelyn (born April 2004), and one son, Finley (born August 2008) with the family residing in Highland Park, Texas. He also owns a home in his hometown of Sault Ste. Marie, Ontario, where he spends much of his summer. Played for Team Canada at the 2006 Winter Olympics. Played for Canada at the 2011 Spengler Cup. ^ "Marty Turco is the smartest goalie in the NHL". CBC.ca. April 4, 2008. Archived from the original on April 27, 2008. Retrieved April 4, 2008. ^ "Video Highlights, Interviews, Stories". sportsnet.ca. February 20, 2009. Archived from the original on March 23, 2009. Retrieved January 7, 2011. ^ "Marty Turco – Chicago Blackhawks". Yahoo! Sports. August 13, 1975. Retrieved January 7, 2011. ^ Gardner, Brad (April 13, 2010). "Stars Will (Officially) Not Re-Sign Marty Turco". Defending Big D. Retrieved January 7, 2011. ^ "Report: Marty Turco signs short-term deal with EC Salzburg". Yahoo! Sports. December 11, 2011. Retrieved February 9, 2012. ^ "Marty Turco signs with EC Salzburg; has NHL-out clause". Yahoo! Sports. January 17, 2012. Retrieved February 9, 2012. ^ NHL Press Release (May 12, 2011). "Marty Turco to provide analysis on NHL Network during conference final" (Press release). NHL.com. Retrieved November 6, 2011. ^ Adam L. Jahns (August 3, 2011). "Marty Turco showing he can hack it on TV". Suntimes.com. Archived from the original on February 3, 2013. Retrieved November 6, 2011. ^ Jesse Rogers (September 6, 2011). "Marty Turco still looking for a team". ESPNChicago.com. Retrieved November 6, 2011. ^ "Team Canada Roster". Spenglercup.ch. Retrieved December 26, 2011. ^ "NHL Opens Season with Game On! Campaign". AllBusiness.com. Retrieved November 6, 2011. ^ Brian Daccord (2008). Hockey Goaltending. Human Kinetics. ISBN 0-7360-7427-9. Retrieved January 7, 2011. ^ "Hip surgery for goalie, heart procedure for Finn". ESPN. May 4, 2004. ^ "Dallas Stars Goaltender Marty Turco Welcomes a Son". People. August 27, 2008. Retrieved January 7, 2011. 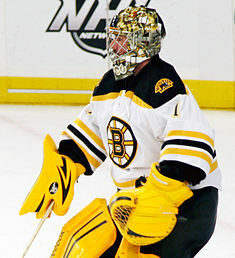 Wikimedia Commons has media related to Marty Turco.